One of the loveliest Savannah vacation rentals for two, Bird Baldwin Parlor is a graciously appointed one-bedroom flat that is ideal for Georgia vacations. Gorgeous hardwood flooring ushers you into the light-washed sitting area where you’ll enjoy the formal mantelpiece, a cozy conversation area and a dining table for two. The parlor features a sleek TV, but you are likely to find your gaze drifting often to the casement windows on either side that offer wide views of Savannah’s lush foliage. High ceilings and an open floor plan create an airy sense of space that flows into the large master bedroom. 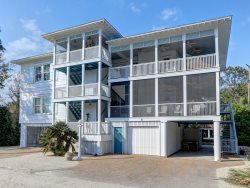 Complete with an ornamental fireplace, a writing desk and a comfy queen-sized bed, it is tailored for the restful relaxation so typical of the finest vacation homes Savannah. The adjoining bathroom offers luxurious utility, including a full tub/shower plus a stylish pedestal sink. The bright, well-organized kitchen provides a full compliment of appliances, including a dishwasher, stacked washer/dryer, microwave, range/oven and refrigerator, so you are all set when you wish to eat in. You will even find sundeck seating just outside your front door where you and your companion can soak in the atmosphere of historic Savannah. Whether you are driving your own car or taking a taxi from the airport, Bird Baldwin house welcomes you with off-street parking and easy access. Once you have arrived, though, lock up your ride and set out on foot to immerse all of your senses in the Savannah experience. The Bird Baldwin house is central to many of Savannah’s famed downtown historic district destinations. It is one of the oldest homes in town, and certainly among the most storied of Savannah vacation rentals. The original portion of the home was built in 1838, and an addition was completed about twenty years later. The first owners, the Lewis Bird family, never got to enjoy their new home due to a fatal explosion during a steamship excursion, but Bird’s partner, an attorney named Baldwin, purchased the newly constructed house and set up residence. Commandeered during the Civil War by General Sherman as a temporary headquarters, the Bird Baldwin house survived many subsequent transformations before being reclaimed and renovated in more recent years. Such rich history amid natural beauty and culture are what make Georgia vacations so much fun. Conveniently located at the juncture of Barnard and Liberty Streets, this Savannah vacation rental is within walking distance of a wealth of historic and cultural sites. Immerse yourself in the vibrant Savannah City Market, which has offered dining, shopping and socializing on the same site since the early 18th century. Take a romantic stroll through Forsyth Park, a nearby 30 acre green space that includes a Fragrant Garden, a spectacular Parisian-style fountain and an intimate cafe. Be sure to see the Confederate Memorial Statue while you are there too. Meander over to Goose Feathers Cafe on Barnard Street for a blue-ribbon breakfast, and then soak up some culture just down the street at the Telfair Museum of Art. Enjoy the down home Southern fare at Mrs. Wilke’s Dining Room, a popular restaurant for residents of vacation homes Savannah and locals alike. If you are a movie fan, you will not want to miss a visit to Chippewa Square at the center of the historic district where Forrest Gump narrated his life story. A few blocks further on, you will encounter the Savannah Civic Center, home of the Martin Luther King Arena and the Johnny Mercer Theater. Plenty of people planning Georgia vacations prefer reserving cost-effective rental homes that have all the comforts they love in friendly and convenient neighborhood settings. Savannah vacation rentals are some of the most sought-after because of their wonderful historical backdrops and stately accommodations, and Bird Baldwin Parlor is certainly no exception. Southern Belle does a great job! We love Savannah and Southern Belle! We had a great monthjust like we live here! We will return for our 16th year next February! I was impressed they contacted me via telephone to see if everything was ok however, I was not yet in the property. The Bird-Baldwin parlor was absolutely perfect! We felt so at home. Savannah is a wonderful city and we can't wait to go back! Very easy to work with and seamless arranging the rental. We called to see if we could park before our official check in time and the team member we spoke with was informative, courteous, and kind. Each interaction we had with the team was positive. Great experience and a lovely property! Loved the privacy, the casual nature of the check-in/check-out process and overall stay. The furnishings were excellent, the house was well kept, and all the features of the home were in great working order. Staying at the Bird Baldwin definitely enabled us to have the historic Savannah experience we were hoping for! Very nice and courteous. Maintenance was at my door less than 15 minutes after hanging up the phone! Staff was great. Took care of appliance issue and shower tap. Helped us set up next year. Staff was really helpful late on Sunday and helped with new reservation. We really love Bird Baldwin House and will return! Quick, pleasant response to TV problem. We love it! We will be back next year! The whole process from requesting the cost through checking out was easy and painless. I was so pleasantly surprised that they didn't jack up their prices well beyond the base price due to the holiday. They're upfront with the costs and don't sneak in any charges. The woman who helped us check in was very friendly, let us know what was going on in the city that weekend, and gave us general directions to our rental (it was super close, so not much instruction needed). The property was affordable and clean with fun historical elements. We loved staying in a truly historical property. The rooms were not only comfortable, but stylishly decorated. We loved leaving from the front door and walking down the front steps for some added historical context. Overall, very pleased and I would definitely stay here or at another Southern Belle property again. Southern hospitality is genuine at the Southern Belle. Thank you. We had a great time in your rental and in Savannah. I appreciate the beer upon arrival! Nice touch! !